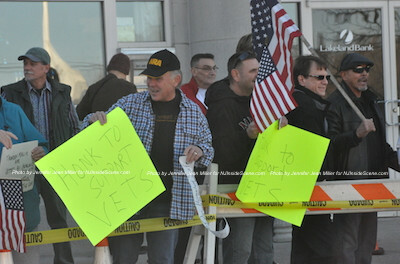 Two counter demonstrators hold up signs asking motorists to honk for veterans. Photo by Jennifer Jean Miller. 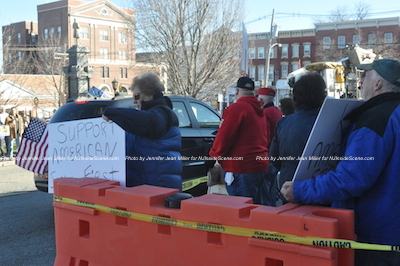 NEWTON, NJ – It was like the tale between two cities with two opposing groups straddling either side of Newton’s Park Place with differing interests on Sat, Dec. 5. 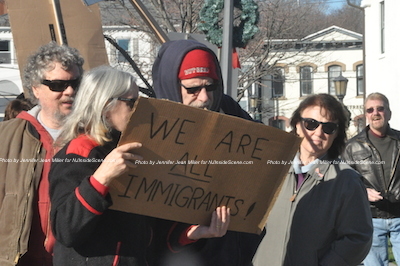 The Demonstrators offer a message that all in the United States are immigrants. Photo by Jennifer Jean Miller. The counter demonstrators hold up signs and wave American Flags. Photo by Jennifer Jean Miller. 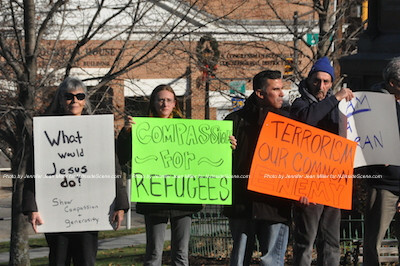 Demonstrators in Newton rallying in support of the Syrian refugees. Photo by Jennifer Jean Miller. “Say it loud, say it clear, ISIS is not welcome here!” was chanted on the opposite side of the street, with a later explosive chant of “USA” repeated over and over. The size of the counter demonstration crowd exceeded that of the demonstrators. “Support Homeless Vets, Stop Refugees,” was one message, plus “You Help ISIS,” “Protect America,” Veterans Before Refugees,” and “Honk to Support Vets.” This group flew numerous American Flags, and waved the yellow Gadsen flag with “Don’t Tread on Me” and the coiled serpent on it. This group broke into a small chorus of “God Bless America.” This side of the street boasted about 110 behind the orange barricade by the end of the two-hour event. 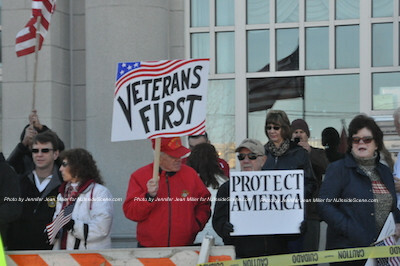 Those on the counter demonstration side hold up signs asking that veterans be placed first. Photo by Jennifer Jean Miller. 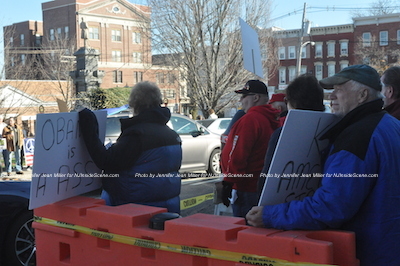 Newton’s Mayor Dan Flynn and Town Manager, Thomas S. Russo, Jr. also watched over the rallies briefly from the corner of Park Place and Main Street. On Dec. 3, the Newton Police advised the public on Facebook about the demonstration and counter demonstration, explaining ground rules in that participants on both sides were welcome to participate, as long as each side remained in the designated areas, and did not harass one another. The demonstrators hold up their signs to the counter demonstrators. Photo by Jennifer Jean Miller. 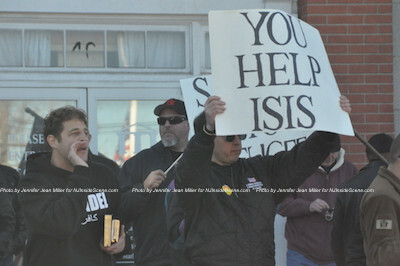 “You help ISIS,” was what one of the signs on the counter demonstration side reflected. Photo by Jennifer Jean Miller. “It’s really important that we are the moral voice that continues to explain how the United States has a moral responsibility to house the veterans, house the refugees from Syria, and end the war,” one speaker said. Selby continued that he was also a veteran and that those across the street could see his VA card in his wallet that they “don’t give those out for free.” He said the person toting the “VeteransForPeace” flag was his brother. 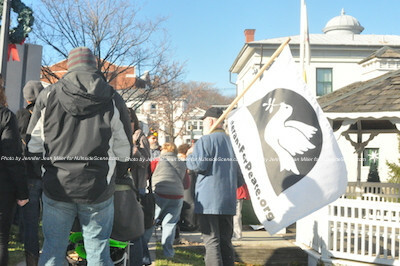 Waving the Veterans for Peace banner. Photo by Jennifer Jean Miller. Barbara Kellam-Scott of Vernon later spoke to Inside Scene regarding a blog post that she said is from a group that often touts itself as Republican, the Cato Institute, sharing the post on the subject of Syrian Refugees not posing a threat. 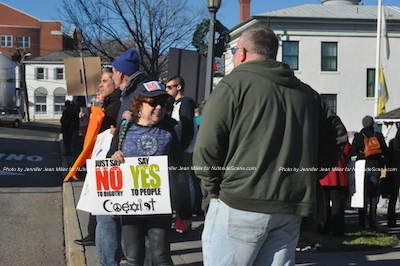 Demonstrators toting signs with the “Coexist” message. Photo by Jennifer Jean Miller. The Cato Institute, on the other hand describes itself as not receiving government funds, and that they receive tax-deductible donations only, and states on its website it is a think tank that supports libertarianism. The group’s post accordingly claims that the vetting system is “so thorough.” However, Wikipedia notes that the Cato Institute disagrees with the conservative front on particular topics including immigration. 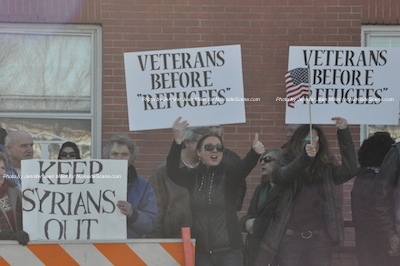 Groups from the Counter Demonstration against the assimilation of Syrian Refugees and “Veterans Before Refugees.” Photo by Jennifer Jean Miller. NJ Inside Scene asked Kellam-Scott about the lack of United States flags on the side of those she was with in the Occupy Newton group. “It didn’t occur to us that they’d [the counter demonstrators] be pretending they owned the flag,” she replied. Hayden told Inside Scene that when he learned of the demonstration with the Occupy Newton group, and began engaging the group’s Facebook Page with facts about the Syrian Refugees, his comments were deleted from the posts. That is when he said he knew he had to take action. With friends who are Iranians and Syrians in the United States, Hayden said that those friends have also advised him that allowing these refugees in is not a favorable idea. “’This is not good,’” his Syrian’s friend’s mother told Hayden. “Countries in the Arabian Peninsula won’t take them [Syrian refugees] and can’t vet them properly,” Hayden added. Behind the barricade at the counter demonstration. Photo by Jennifer Jean Miller. Hayden said that he could not see how monetarily it could be possible to take in the refugees either, with approximately 10,000 homes in Sussex County in foreclosure, and then about 4,500 people that are battling homelessness, and requiring resources and assistance around the area. 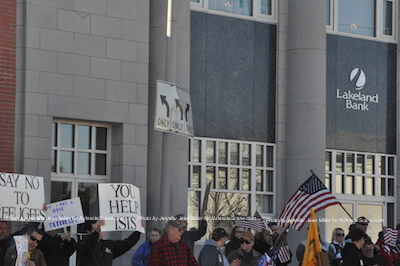 “It was a good turnout,” Hayden said about the counter demonstration group. 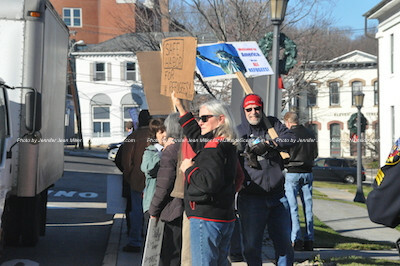 It started with about 64 in the early part of the rally, with the number increasing to 85 and then concluding at 110. 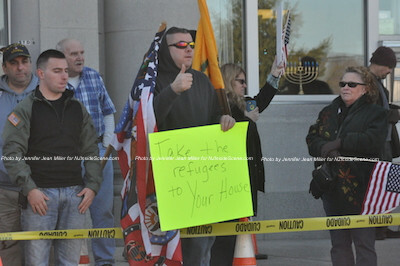 A counter demonstrator gives a thumbs up while holding a sign that refugees can be taken into the demonstrators homes. Photo by Jennifer Jean Miller. While a few cars honked in support of the Occupy Newton demonstrators, most, as demonstrated by the video below, beeped in support of the counter demonstration attendees. Some driving by raised their middle fingers at the Occupy Newton group, or gave that group a “thumbs down,” to them as they rode through. Support local! We are a woman-owned, family-run, grassroots, objective news outlet, offering the “inside scene” to every event we cover! Be a part of Inside Scene for all time! Donate here and have your name or the name of someone you would like to honor on the Inside Scene Wall of Fame. 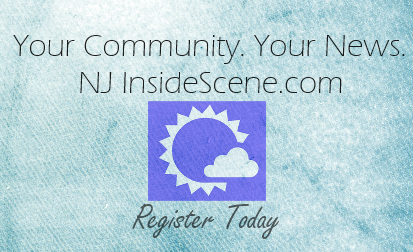 Click here to follow NJ Inside Scene on Facebook.